Optimism that media development in the country was headed in the right direction has evaporated, the Cambodian Center for Independent Media (CCIM) survey finds. Of the 75 journalists working within both pro-government and more independent outlets who were anonymously surveyed for the report, 92 percent considered the closure of scores of radio stations and other media outlets last year to be politically driven. "A sector that once offered a semblance of democracy with pockets of free and critical news coverage — amid a sea of ruling party affiliated television and newspapers — has been cut down and left reeling," it concluded. "Reporters say they work with a keen awareness that they could be next targeted for their work." In the lead-up to this July's national election, the government has orchestrated a prolonged crackdown on dissent that has seen the only viable opposition party dissolved, its leader jailed and its senior members banned from politics. Thirty-two radio channels across 20 provinces that broadcast non-government-aligned and often critical content were forced to close last year by the government. FILE - A portion of the Radio Free Asia homepage is seen in this screen capture. The U.S.-funded outlet was closed in Cambodia because of what it called intimidation. The Cambodia Daily newspaper was ordered to shut down over a disputed tax bill, and Radio Free Asia suspended its in-country operations citing threats, and amid a dispute over its tax status. Two of Radio Free Asia's former reporters, who allegedly continued to communicate with their head office afterward, have been charged with espionage, as has an Australian journalist for reasons that remain largely unexplained. Within this context, CCIM's survey found those who felt the industry was headed in the right direction had plummeted from 71 percent in 2015 (a report was missed in 2016) to 11 percent in 2017. Journalists who reported verbal or physical attacks at some point had risen 12 percent since 2015, while 47 percent said they had been threatened — an 18 percent increase on the previous survey. Increasingly, journalists and sources were communicating through encrypted messaging, fearing reprisals. The biggest problems for journalists were identified as government influence and control (49 percent), and prosecutions or legal threats (18 percent). One positive note from the report was an increase in previously low rates of training that journalists said they had received, though much of that training appears to have come from government-affiliated entities. 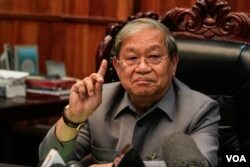 Minister of Information Khieu Kanharith, who was shown an advanced copy of the report, and his undersecretary of state, Mean Sophorn, both canceled their scheduled appearances at the launch of the report. Those who did attend as guests at a panel discussion at the launch had mixed reactions to the report. Club of Cambodian Journalists President Pen Bonnar, who also is the news director of ruling party Senator Ly Yong Phat's TV station, PNN, said the report's findings were a bit overblown. "For me, for the closure of two or three media outlets as a journalist, I am sorry. I do not want to see the newspapers or radio shut down," he told VOA on the sidelines. "But the closure of those offices, I think it's not as bad as the report said — that it is the catastrophe in Cambodia — I do not think so, because there is lots of news media, listeners can find other sources." Huy Vannak, president of the Union of Journalist Federations in Cambodia, who simultaneously works as an undersecretary of state at the Ministry of Interior and in a senior capacity at several pro-government news outlets, suggested the idea of journalistic independence was largely a myth anyway. "For me, in politics I speak one thing, and in journalism I speak another. But I don't lie to the people. There is no one-size-fits-all resolution. There are varying issues in the media sector," he said. What is important is integrity and professionalism, he maintains, while also dismissing concerns about the security of journalists. Sometimes, Vannak said, he has had to report journalists with "mental illnesses" who cursed authorities at the Ministry of Information, and he said he urged reporters to avoid causing headaches by focusing on politics too much. Kulachada Chaipipat, advocacy manager of the Southeast Asian Press Alliance in Bangkok, said it was a major concern to see one of the beacons of press freedom in the region backsliding. "Compared to the other countries in the region, the picture here is not unique but it only adds up to a bad score on the regional media landscape," she said. "For Cambodia it is alarming, alarming because it is the country being viewed by outsiders beyond this region or media or press advocacy groups in the region as one of the shining examples of countries ruined from years of war and then to emerge as a vibrant democracy in transition," Chaipipat said. Government officials took aim at one of the few independent media voices left in Cambodia this week, accusing local newspaper The Phnom Penh Post of misreporting that Germany had suspended preferential travel visas for some Cambodian officials. Deputy Prime Minister Sar Kheng reportedly called the article "fake news" fabricated by the opposition, despite the fact it was sourced from an official German parliamentary document later verified by the member of parliament who wrote it. Asked about the matter, Huy Vannak said he could not make a judgment, as it required further investigation, while Pen Bonnar told the audience he did not think the newspaper had done anything wrong.